PARTICIPANTS: Check-in after 6pm near the "O" sign near 1077 W Randolph. People-powered wheels strictly required. SPECTATORS: Come near Finkl on Cortland by Kingsbury before 11pm. Wave and cheer safely from the sides, behave yourselves, come without car. I though Columbus tried to participate last year, but I never received any details about the ride. Ran across this while looking for things to do in Chicago. Le Tour Ultime, the most ultimate Cycling Challenge in the world! The Tour the France (more than 4000 km) non-stop in one stage. Chain CondomTM was created by a professional bike team member and has been used by top pros. Click here to read the Chain CondomTM story, or click here to see how easy it is to put the Chain CondomTM on your bike. 800 Lumen light from Dinotte! When you need the highest level of brightness plus the flexibility of dimming, flashing, long run times with the durability of LED technology, the 800L systems provide the best choice. 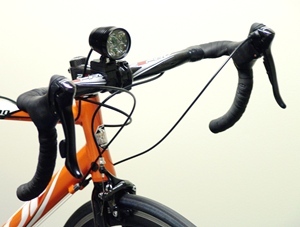 The 800L is a four LED product sure to impress any road or mountain bike user. It's our brightest light yet, and has a wider beam than the 600L while maintaining similar intensity. The 800L light series offers unique features such as the instant HIGH power - Regardless of your operating mode, we have one button reserved to be the highest setting possible when there is not time to fumble around with lights. our flashmode also has one light steady while the other two strobe. The 800L-LI-4C includes Light engine, 2 batteries, worldwide smart charger, extension cable, straps and O-rings. If you wish to add a helmet mount, it must be selected as an option. The 800L run times are PER battery, so when we say it's 2.5 hours on high this is a per battery calculation. This package can be purchased with or without batteries (existing customers may already have batteries), but this light should only be powered by our four cell battery. If you’d like to have Pedal Instead at your event, please contact Catherine Girves at cgirves@uaea.org. Brett and I ventured out for the century option for HOOT 2009. We had two others cancel because of a late night, medical conditions, and the medical conditions that occur from a late night. Nice temps and weather to start the ride. The ride is billed as hilly and it definitely lives up to the billing. We climbed 5500 feet over 105 miles. The "makers" had Revenge and Savage hils on the ride. At mile 74 we ran into a 19% grade climb that forced me off the bike. I had mechanical issues and was off the bike for another 1.5 hills. Brett was forced off several times as well because he rides a single speed. We stopped at the Liberty Bell restaurant in Bremen. They don't take credit cards which posed a problem. Good food and service. We gathered up enough cash to cover, but shorted the tip. Sorry about that Ms Waitress. : ( After lunch it seemed to heat up and I went through a ton of water/gatorade. It took a lot longer than I planned plus we missed a few of the turn marks. We got back to the start and another group showed up. They also had problems with turn markers and a 50 mile ride turned into a 72. Very strenuous ride and we all agreed that it was much tougher than any other COP ride to date, with the exception of CFC which I have not ridden. I parked next to a woman at HOOT who had a custom painted IF bike. Very nice. North on High to Bernies, .04 miles, about 7 riders.